The Cowboy Wind Farm in Blackwell, OK began in 2008 when David Savage, a Kay County, OK landowner partnered with other local land owners and *OwnEnergy. David and his father Mark enlisted 17 landowners to dedicate 5,000 acres to the project. 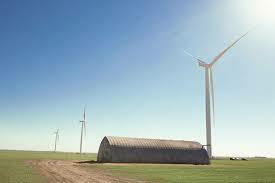 In 2012 the project was acquired by NextEra Energy who completed construction in December of 2012. The power generated will be sold through OG&E to Oklahoma State University. The 20 year contract will drive cost savings for OSU by providing a hedge against pricing volatility and through the retirement of the existing co-generation facility.